We live in a connected world where we have access to several tools to assist in finding any information we need. If we choose to do something risky, there is often some type of notification that warns us of the risk. The same holds true in IT departments. When a problem occurs, we search for answers that allow us to make decisions and take action. What problem created the outage? Do I need to increase the bandwidth or choose a CDN offering? Do I need to replace my devices or add a new instance to a cluster? We all know that connected IT can help us make critical decisions. In the past, we have depended on standalone, best-of-breed security solutions that detect and mitigate locally but do not share data with other mitigation solutions across the network. Even when information is shared, it’s typically between identical solutions deployed across various sites within a company. While this represents a good first step, there is still plenty of room for improvement. Let us consider the physical security solutions found at a bank as an analogy for cybersecurity solutions. A robber enters a bank. Cameras didn’t detect the intruder wearing casual clothes or anything identifying him or her as a criminal. The intruder goes to the first teller and asks for money. The teller closes the window. Next, the robber moves to a second window, demanding money and that teller closes the window. The robber moves to the third window, and so on until all available windows are closed. Is this the most effective security strategy? Wouldn’t it make more sense if the bank had a unified solution that shared information and shut down all of the windows after the first attempt? What if this robber was a hacker who is trying to penetrate your system? Would you allow the hacker to try and break into more than one network silo after the first attempt? As we’ve seen in the example above, having mitigation solutions that can share attack information allows an organization to block a new “signature” when you see the request. But this only applies when the traffic reaches the solution. How could the bank better protect itself from the robber? Should they do active verification at the entrance? No, it would be time-consuming for customers who may consider not coming back. Should they keep a list of customers allowed? No, otherwise they would turn off new customers. Should they signal the risk to other desks and entrance security? Yes, that way all windows would be closed simultaneously and security guards would be able to catch the intruder and any future attempts to enter. Imagine these windows are your different sites and the security guard placed at the entrance is your security solution at the perimeter of your network. Identifying abnormal behavior from normal behavior requires you to perform analysis of network traffic. The more advanced the analysis is the closer to the backend application the solution is. That way we can ensure only traffic allowed by prior solutions doing first security barriers gets through. Being close to the application means that analyzed traffic went through: router, firewalls, switches, IPs, anti-virus, anti-DLP and many other solutions (in classic architectures). Organizations require a fully integrated WAF and DDoS mitigation appliance that can communicate effectively to allow WAF solutions (deployed close to the application) to warn anti-DDoS systems (deployed at the perimeter) that an attacker is trying to penetrate the perimeter. In the blog “Accessing Application With A Driving License,” Radware recommends blocking any requests coming from clients with abnormal behavior. This mechanism was only applied to the WAF, but with this added communication, it goes even one step further and blocks bad requests and/or bad clients who are trying to access your network. With a fully integrated WAF and DDoS detection and mitigation solution that communicates with one another, these devices will save you time and processing power and they will be more effective in blocking intrusions to your network. 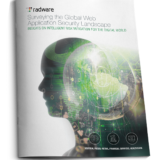 Download “Web Application Security in a Digitally Connected World” to learn more. As all applications need to be both secured and fast, the industry moves towards mitigating bad bots. As nearly 25% of all web traffic is generated by bad bots, we have to be sure we can detect and block them. Of course, this ratio depends on your market – for example, gambling companies and airlines have approximately 54% and 44% of their traffic coming from bad bots, respectively.